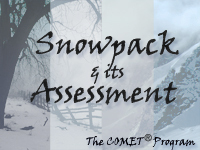 This module explores the science of snowpack and snowpack assessment. It begins by describing the factors involved in snowpack development and then focuses on snowpack evolution. Using two scenarios (one set in mountainous terrain, the other in a relatively flat area), the module explores how basic processes, such as conduction and radiation, and various precipitation events impact snowpack, particularly its density, structure, and stability, throughout the cold season. Woven throughout the module are video clips of avalanche forecasters discussing snowpack and demonstrating various assessment techniques. The module is intended for weather forecasters, emergency managers, hydrologists, recreationalists, and climate researchers, and provides the background information needed for understanding the science and forecasting of avalanches. This is on the job training, and I grew up watching wildlife, outdoor shows, Nat Geo, plus the luxury of living in remote areas.